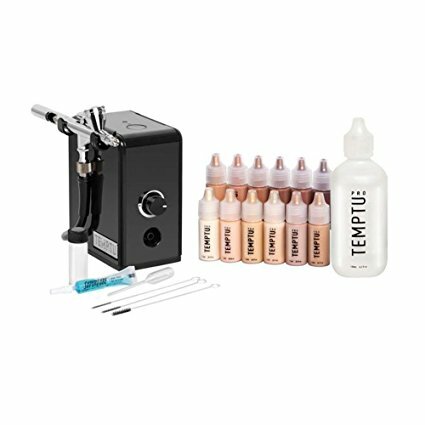 Airbrush Makeup System; natural or not? Can you imagine having a fresh natural-looking, flawless face? As millennials living in a selfie-obsessed world, we can’t help but wonder how those Instagram models achieve their perfect look. I have never been a fan of makeup, but the perfect glowing skin celebrities manage to have intrigued me. So the question this begs is; is it Airbrush Makeup or Traditional Makeup? Traditional makeup comes in a liquid, cream or powder form that is applied by fingers, sponges, and brushes. The particles are not acutely refined to achieve an even spread throughout your face. It will not grant you with that stunning Instagram - model glow that is highly coveted. The airbrush makeup system is a finer product compared to traditional foundation. It works as a spray and emulates the way a camera views your face. It is more of tiny pixels being applied and not a blob of paint. This is to blend the color to your face, moving it down the neck for a smooth and seamless finish. It gives that natural, non-cakey look that will hold for hours. There would be no need for either touch-ups or streaks running down my face because of the hugs, sweat or tears. Well, after exploring airbrush makeup systems, I am sold. I am getting out of my comfort zone and trying out all things makeup. I intend to have that camera ready, pro makeup, with an innocent, fresh-faced, natural look only possible with high-quality products and professional touch. The question is; how do I spot a winner? What To Look Out For When Buying a Airbrush Makeup System? The coverage you want plays a role. Spray guns will cover a large facial surface area which makes for ease of blending and covering. 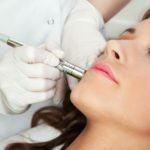 If you are in the market for details, an airbrush makeup system with a long pointy needle is what to look out for. If you are a beginner, acquire an airbrush makeup system that will ‘forgive’ your mistakes. As beginners, we encounter user problems rather than product ones. A system with clear instructions for the user is a winner. For veterans who can operate an airbrush makeup system; clean and change paint consistency. Try out various methods until you find the desired one. This is time-consuming, and you may have to kiss many frogs before getting the prince. You can also r﻿ead reviews or combine reviews with experimental research. How paint appears on the surface is influenced by its approach in the airstream. Internal mix introduces paint into the center of the airstream. This gives fine details and consistent spray. External mix paint is launched from the side of the airstream, producing a squeezed O or D-shaped spray pattern. It produces a grainy and non-consistent spray, lacking fine details. Choose an airbrush makeup system with dual action for physical manipulation of the airbrush. This is when you press down for air and pull back for paint. You can manipulate how much you want to spray. Single action starts the paint the moment you press for air. It also sprays the same amount of paint throughout but a knob controls the flow. Always go for gravity feed unless you have reasons to look for something else. The gravity feed pulls down the paint to the nozzle’s tip. It uses less pressure to spray, functioning even at a drop of paint making it economical. The siphon feed generates low pressure at the nozzle tip. It uses more air than the gravity tip but can hold more paint according to bottle size attached. Evaluate the manufacturer of the airbrush because there are some trusted names in quality and functionality. Badger, Paasche, Iwata, Harder, and Steinbeck are some names synonymous with airbrush makeup systems. After taking all the above deets into detail, these are the Top 10 Best Airbrush Makeup Systems that I fancied. The airbrush makeup system is a girl’s best friend. If in doubt, take a keen eye on the fabulous custom blend makeup celebrities have on. 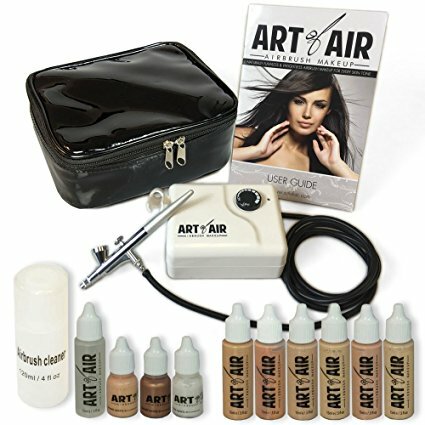 The Art of Air Professional Airbrush Cosmetic Makeup System is for both the beginner at home and the professionals on the go. This product has a cosmetic makeup brush and compressor system that needs to be plugged in while in use. The Art of Air 6 piece Fair and Medium Foundation Set is designed to provide an ultra-fine film of makeup while in use. This allows you to achieve a perfect, soft natural skin tone. It contains blush for that healthy looking complexion and bright face. A bronzer gives the eyes and cheeks a sun glow. For that dazzling emphasis on eyes, cheeks, face and body, a shimmer is included. An anti-aging primer for use before, during and after makeup is applied. The deluxe black airbrush makeup system carrying bag is convenient for carrying makeup when you are at home or on the go. Once bought or delivered, it is easy to assemble. If you are unsure of how to use it, some YouTube tutorials demonstrate how to utilize it to apply makeup. The compressor is fully adjustable and air pressure controlled by a knob on the compressor. This has the edge over other similar compressors that only allow specific air pressure, low, high and medium. The variety of 6 different shades of the foundation is a perk due to the variety. If you find the perfect shade for you, your face will end up being flawless, without the blotchy or cakey feeling. The foundations can get sticky if you do not shake the contents well before application. This is because after sitting, certain pigment colors can separate from the base. This is convenient, easy to assemble the product. The six different foundations form a basis for choice since you can find a shade matching with your skin resulting in a flawless skin tone. 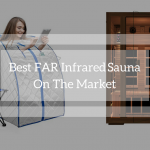 It is designed for a beginner’s home use and a professional on the go. The most distinct feature about it is; it can only come in contact with the face. Belloccio’s﻿﻿ best airbrush foundation produces flawless results in minutes. It delivers a classy look with minimum effort. It being water-based allows the natural skin to glow and is safe for all skin types. The compressor has three air flow settings allowing it to be adjusted from low, medium to high. It boasts of an anti-aging moisturizing primer for a youthful look. The blush instantly brightens your complexion. Shimmer elicits a radiant effect on cheeks, face, body and eyes. The bronzer emits a healthy bright afterglow. An airbrush cleaner ensures hygiene with the applicators. It has extras of 5-gram jar of Belloccio's medium shade concealer with an egg-shaped makeup sponge to apply it. 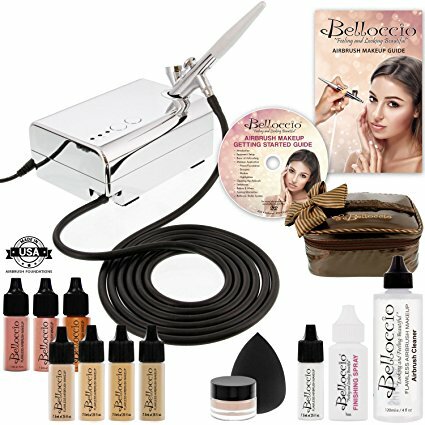 Belloccio’s contains a 1-ounce bottle of Belloccio's airbrush makeup finishing and setting spray. A user guide, a DVD, and a manual are included for easy navigation. Makeup never touches the hands, brushes or sponges. Makeup contamination is eliminated, and the skin remains unaffected. Your skin would break out if came into contact with contaminated makeup. The airbrush has a tanning feature for your face, neck, and body. This brings that smooth, seamless finish of makeup well applied. The makeup hues are good. Get in touch with that little girl in you, experiment and have fun with colors until you get the best color for your skin tone. Cleanup is instant. Fill the cup with the cleaner that comes with the product. Spray a little through it placing your finger on the tip. Allow it to bubble back and spray again, uses a Q-tip to clean bowl and tip. Unscrew and wipe off the needle. When cleaning up the airbrush, unscrew the needle holder carefully lest it goes down the drain. The needle being dainty can easily slip from your finger. Contaminated makeup is the skin’s number one enemy. This product appeals because of the cleanup factor that enables the applicators to remain uncontaminated. 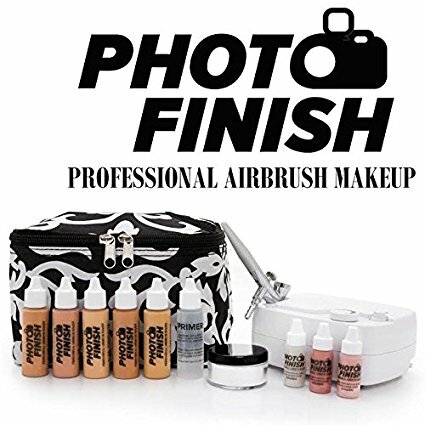 The Photo Finish Airbrush Makeup kit gives the most flawless finish for all skins types. It is oil-free, mineral based with non-harsh preservatives. It portrays the best airbrush makeup for brides as it is long wearing, water resistant, and smudge proof, perfect for everyday use. It contains a gravity feed airbrush with 0.3mm tip and a sixteenth-ounce cup. Neroli Anti-Aging Moisturizing Primer, the concealer that covers age spots, dark spots, and circles under the eyes. The kit has soft mauve blush, a pearl shimmer highlighter and silica finishing powder that diminishes the look of fine lines on the skin. It is great for home users, beginners, and professionals. The Silica finishing powder lessens the look of fine lines in the skin allowing for a flawless finish with both amateur and professional application. The airbrushing sprays a thin film, so the makeup is spread evenly on your skin. It can be the best product to use at home since it does not require much work to minimize skin imperfections and give a beautiful natural look. It does not smear, run, fade or cake for 24 hours. The electric use is a deterrent for as it may not be used in places where there are no power outlets like in the shower. That I can just spray this airbrush and have it settle evenly on my face is a great pro. It does not draw the line between professional and beginners since the makeup will be flawless as long as the product is operated right. 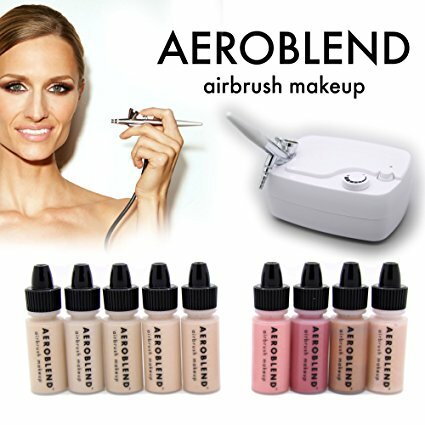 You will regret why you never used the Aeroblend Airbrush Makeup Kit before, after trying out this makeup. It conceals just about any blemish or spots that result in a caked look with regular products. It smoothens out wrinkles making the skin flawless. It is one of the best professional airbrush makeup systems. It has an air compressor that is portable and includes five aeroblend foundation colors to match your natural skin tone. It contains two aeroblend airbrush blush, one aeroblend highlighter, and bronzer. The Aeroblend Airbrush has an ultra-quiet compressor, double action airbrush stylus, hose and 110 volts plug. It also comes with a one year warranty. The air compressor that sets the air pressure is small. It does not produce noise and can be used while traveling as it is portable. The one year warranty is a big pro just in case this makeup airbrush develops a technical hitch that the manufacturer can rectify. There is an exclusive color match guarantee. If the shades do not match your skin tone, colors desirable to you can be shipped to your doorstep for you to make a choice. Being the best water based airbrush makeup; it can simply be washed with soap and water. 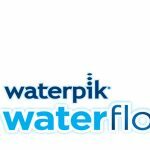 Water based products do not need alcohol based removers. The need for a power outlet may in some circumstances limit you in areas that do not have this provision. For the airbrush makeup system to function, it requires to be plugged in. The product may come with limited colors that may not match your natural skin tone. This requires you to request for additional colors to be delivered meanwhile consuming time. What I do I think? I am a little girl at heart, just like every other girl, so it would give me a lot of pleasure to get a variety of colors shipped to my doorstep if the ones that I got originally do not match my skin tone. After all, who does not enjoy that personalized attention? This adds weight to this product. Behold the beauty of the Luminees Legend Airbrush system that with slow circular motions, you can achieve flawless precise application. It is one of the best airbrush makeup systems for composition with its quiet motor, making it conducive for daily home use. 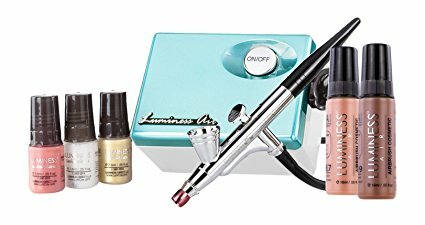 The Luminess airbrush legend system that is dermatologically tested is portable and durable. It has a Legend Airbrush Compressor, Stylus AC Adaptor, and 1 Year Warranty. The quiet motor makes for perfect airbrush application anywhere. Since the motor does not make noise, it can be used at home where silence is necessary. The touch-less application ensures your skin is protected. You do not have to touch the cosmetics, apply on your face then touch it again, transferring germs from your face, fingers to the cosmetics. 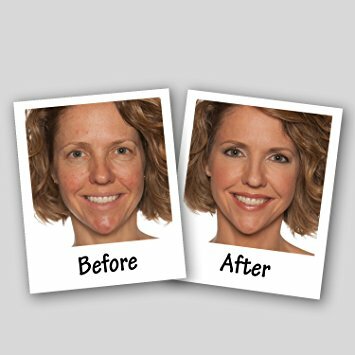 The specially formulated airbrush foundation covers unwanted imperfections like tattoos, discolorations, wrinkles, scars, bruising and scars. It covers up these blemishes in one spray. The water based full coverage formula is best for acne and sensitive skins. It is not laden with ingredients that can react with sensitive skins. You just plug in your machine and apply makeup without dirty brushes or sponges. Cleanup is a breeze. Use a cotton swab to clean the insides of the stylus bowl and tip. The Luminees air plug takes up a lot of outlet space. The plug takes a lot of space because it is brick style. The Luminees Air system can only use Luminees products so you cannot substitute with your favorite makeup. You may want to use another brand that has colors matching your skin tone. If you forget to clean it, it becomes a chore to clean it up later. The cosmetics will dry up if not washed immediately. The ease of using it at home to create a professional, natural look got me hooked. The aspect of allowing the skin to breathe too is appealing as we are all leaning towards the natural look that is healthy for the skin. For beginners, this is perfect. 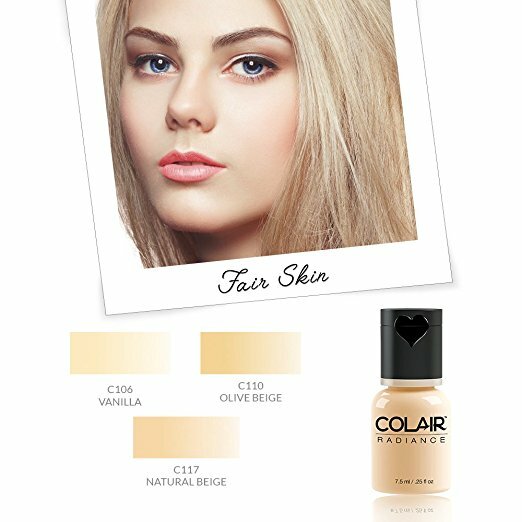 It has a broad range of foundation shades for all skin tones. This lightweight compressor is ideal for any Pro Makeup Kit. The kit contains, Airbrush 2.0 Compressor with a maximum pressure gauge of 30 PSI, supporting all levels of applications. An SP-40 Airbrush, cleaning kit, 4-ounce cleaner and a single action gravity fed gun for continuous flow of air. It has a variety of foundation shades for all skin tones. The foundation shades are diverse. It can easily clog up unless taken apart for cleaning which is time-consuming. For effective cleaning, each part needs to be cleaned separately. That I can easily buy an airbrush makeup system and get access to foundation shades that match my skin tone is a big plus. Most makeup systems may lack many shades leading to a re-order or changing the system altogether. 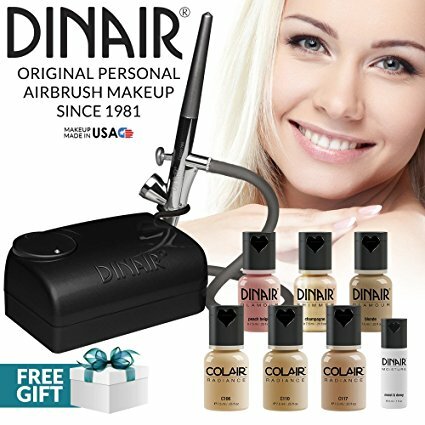 The Dinair Airbrush Makeup Starter Kit has flawless airbrush makeup foundation, moisturizer, and compact beauty compressor. It comes with three bonus multi-purpose colors and an official Dinair airbrush makeup seller. Dinair originally had the best airbrush makeup reviews for providing actors with quality makeup. Dinair brings over 30 years of expertise into your home; facilitating you to apply makeup that is healthy and does not clog up your pores. The kit includes a three shade foundation, 3 multi-purpose shades and 1 peach glamour for lips or blush. It has 1 champagne shimmer highlighter or eye shadow, moist natural moisturizer, 1 airbrush silicone grip, and cleaning system. Dinair has a 6 feet hose, 1 airbrush cleaner solution, 1 CX pro airbrush continuous flow, and 1 Pro Compressor 1 – speed. Complete with an instructional guide and 1 year’s warranty. The makeup is sprayed onto the face; giving desired coverage from sheer to opaque and the result is lightweight, natural and undetectable. The instructional guide makes it simple to use. The guide has step by step guides that are easy to understand. Clean up takes a bit of time to avoid clogging. Cleaning the makeup system thoroughly takes longer than some other systems. It is mind blowing encountering such a versatile airbrush makeup system. I can go wild on the eye shadow, contouring, eyebrows, lips, and face, experimenting with these features until I come up with the perfect look. That gives me such joy. The Iwata-Medea Single Piston Air Compressor requires zero maintenance. It has oil-less, and low maintenance piston air compressor and motor, as well as high-strength polyurethane hose, fits Iwata airbrushes. It includes a built-in airbrush holder and a carrying handle that’s ready to go anywhere. A metal cover provides protection with an airbrush sold separately. It is the best airbrush makeup for a wedding day. The loud noise is appealing to brides who feel like a lot is being done. A lot that they could not have done on their own. After it warms up, it performs excellently. It takes a bit of time to warm up but does not lose momentum after it’s ramped up. It elicits loud noise and takes a few moments before it warms up and starts working. Me thinks that there are moments we need to persevere with some inconveniences like the loud noise emitted during the makeup process. Kudos to all brides who have endured this and emerged camera ready. The Art of Air Compressor and Airbrush Combo for Professional Kit is lightweight and portable, offering you full control over the air flow by being fully adjustable. It produces excellent natural looks ranging from concealers to foundation. This product contains 1 fully adjustable compressor with airbrush holder, and 1 single- action, gravity feed airbrush. It has a 1 airbrush hose, 1 power adaptor, and 1 adjusting tool to calibrate airbrush. It has a smooth, non-clogging steady spray for a natural look. The single action gravity feed allows for the constant flow of paint. The air flow is fully adjustable using a knob that gives you control over how you would like to control the air flow. The compressor allows for three levels of adjustment. The power source may be an issue if you need to use a plug where there is none. Places like a bathroom may not be equipped with a power outlet. The easy do it yourself look that is achievable with the Art of Air compressor is a positive. Every girl wants to emerge from the house with that effortless look, seeming like they did not try hard to achieve a natural fresh look. This air compressor facilitates that. How cool is it to have an airbrush makeup system that not only airbrushes makeup but also work on temporary tattoos, nail art, tanning, and flawless facial coverage. It has a provision for both professional, personal use and a money back guarantee. 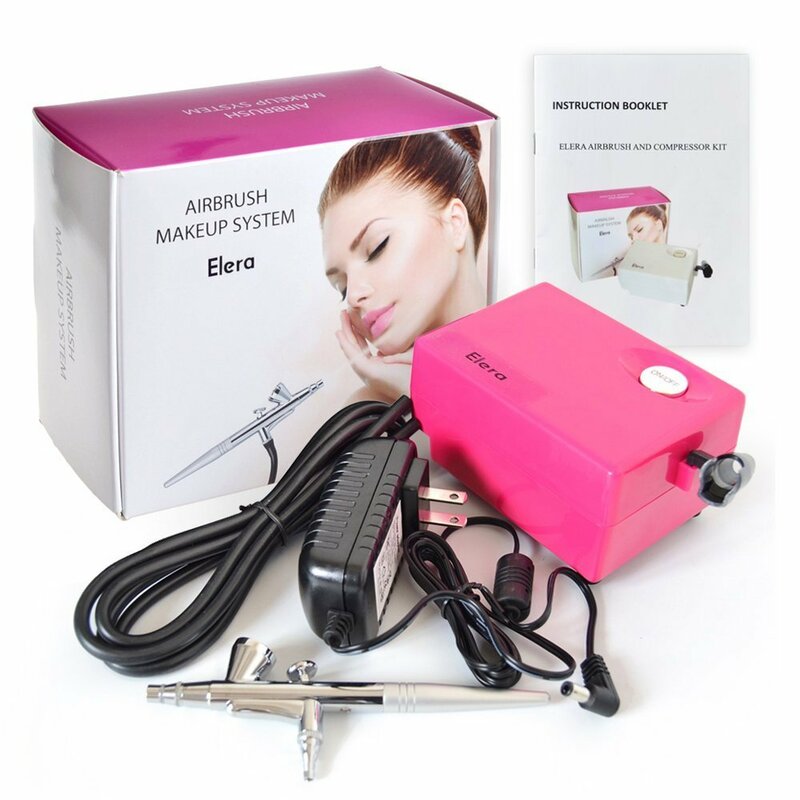 Elera updated versions airbrush makeup system kit includes a high definition airbrush gun. It has a portable compact airbrush compressor machine that’s nearly silent. It allows operations of 3 airflow settings. It holds an in-built airbrush holder black rubber airbrush hose and operates at 12V DC with an 110V-240V AC plug with a maximum air pressure 25 PSI. The airbrush makeup gun minimizes skin imperfection while giving a lovely natural-looking finished result. The spray gun covers a wide area that facilitates blending of color to the skin for a flawless finish. The unit is easy to assemble. Putting it together before starting to use it is simple and you can easily do it yourself. 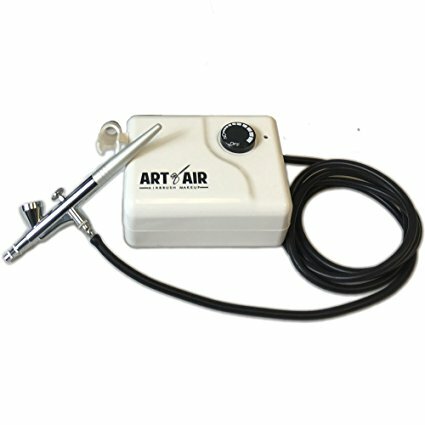 The three adjustable settings in the compressor give freedom with control of the airbrush. Airflow can be monitored for different effects while airbrushing. Cleaning it is a chore. Before getting the hang of cleaning it well, trial and error is the norm. You had me at nail art. The Elena updated version airbrush makeup system is versatile with more than just makeup. It also focuses on other aspects of beauty, making it holistic. If for no other reason, I would go for it for the nail art factor. The airbrush makeup systems have come a long way since traditional foundation application that was time-consuming. The brand names Iwata Medea Studio series have a track record of durability and quality. The Photofinish with the silica finishing powder offers the most flawless finish for all skin types. The Original Dinair elicits a professional look for a home application due to their presence in the industry for years. They have understood airbrush makeup and modified it for amateurs. We are spoilt for choice when it comes to makeup. Who knew that a time would reach when achieving that fresh-faced natural look would just be a spray away? There is no contamination of cosmetics. Airbrush makeup systems have come a long way to the point of makeup hold for 24 hours and waterproof. It is a dream come true; so choose one airbrush makeup system that resonates with your needs. Overall I would recommend The Photo Finish with the silica finishing powder. It offers the most flawless finish for all skin types. You will keep them guessing… makeup or no makeup? Hmmmm. I hope you find this airbrush makeup reviews helpful when deciding the airbrush system that suits you.